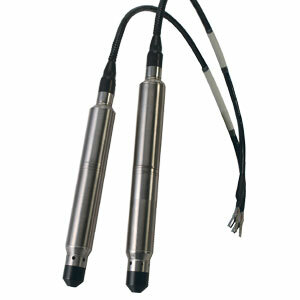 The PXM709GW Series submersible depth transducers are designed to make precision level or depth measurements in fresh water or liquids compatible with 316 SS reliably for years in harsh industrial environments. Applications include Level Monitoring and Control, Depth Measurement, Surface Water Monitoring, Tank Level, Well Water Depth, Waste Water Applications,Dewatering Installations and Construction Bypass. Inconel® models are also available for oceanic research and highly corrosive or salt water applications. Consult Sales for availability. The PXM709 series has the proven Omega micromachined silicon technology as its core sensor. The Piezoresistive technology uses precision solid state strain gages molecularly embedded into a highly stable silicon wafer. The silicon is mounted in a sealed chamber and protected from the environmental fluids by a pressure sensitive stainless steel diaphragm. A very small volume of silicone oil transfers the pressure from the diaphragm to the silicon sensor. The cable is molded onto the case using a unique high pressure, high temperature system to assure the best possible quality seal for long life and durability. This technology produces a very rugged, high stability sensor with exceptional accuracy, minimal thermal effects and long term reliability. 注: 1) Comes complete with 5-point NIST traceable calibration certificate. 2) To order with additional cable length, specify total length in meters, additional cost for length over 3 meters. i.e. PXM709GW-001BGI-12M (12 meter cable). 3) To order with optional 0.08% FS accuracy for extra cost, insert code “-HH” after “I”. I.E. PXM709GW-3.5BGI-HH. 4) To order with ½ NPT Conduit fitting for extra cost, specifiy Model PXM709C. i.e.PXM709CGW-170HGI. 5) To order with optional Lightning/Surge protection for extra cost, specify Model PXM709LGW, i.e. PXM709LGW-001BGI.